Everyone is aware of dinosaurs existence and extinction and that happened by an asteroid that fallen over their time column roughly around 65 million years ago. A direct terrible hit on earth by a big fireball from the sky and turns everything that once wandering and ruling the earth to became bedtime stories. 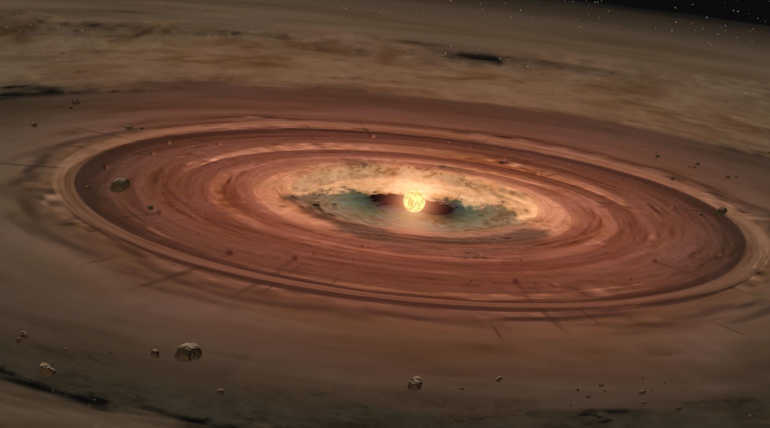 Now the scientists are believing that another rogue star is preparing to make an indirect contact with earth in future roughly around one and a quarter million years later from the present. Scientists Berski and Piotr A. Dybcznski have calculated the Gliese 710 will hit the solar system after 1.35 million years by referring the data set of Gaia satellite. But now two scientists from the University of Madrid Raul de la Fuente Marcos and Carlos de la Fuente Marcos have estimated the time of Gliese 710's arrival to the solar system and concluded that the rogue star will be there at the edge of solar system approximately in 1.29 million years from now. The Gliese 710 is a star that cruising at the speed of 32,000 miles per hour in the course of our solar system is classified as a rogue star. The star is on its trajectory to our solar system from the constellation Serpens Cauda. Scientists believe that this star will give a terrible flyby to the earth in the future by disrupting the Oort cloud of our Solar System. The Gliese 710 is calculated to be with the 60% of sun's mass and 67% of its Sun's radius and it will come show up to the earth at the distance of 9,000 Au from the Sun. But one can think it is not that much closer to earth. As said previously it won't give a direct contact with earth it ought to contact the edge of the solar system the Oort cloud and direct them in the course of the earth. The Oort cloud is a theoretical ice planetesimal strong solid objects that thought to have existed in the debris disk around the sun at the distance of 3.2 light years. The strong hit of the rogue star could turn them into the solar system that may result in an unbelievable mass comet shower. The scientists are hoping that this Gliese 710 have that potential to create a mass disruption to the solar system and the earth. Hence the thing had been classified as a rogue star.